In the moments that matter to travellers, your brand can only be useful and relevant if it shows up. In the final part of our six-part series, learn a simple way to assess your brand’s opportunity to be there in travellers’ moments and how to measure success. Family holidays, destination weddings, last-minute getaways: People’s need and love for travel hasn’t changed much over the years. But the way people research, plan, book, and experience these trips has changed dramatically, thanks to one thing: mobile. This new journey is made up of hundreds of moments that ultimately shape travellers’ preferences and decisions, from their final destination to the brands they choose to book. For travel marketers, we’ve identified four crucial travel moments to win: I-want-to-get-away moments, time-to-make-a-plan moments, let’s-book-it moments, and can’t-wait-to-explore moments. So, for the moments you've identified to be there and be useful for, how do you know if you're actually showing up? Look at your share of intent. Share of intent is a simple measure of success. It's the number of times you’re there for searches in each moment. Consider the chart below. It illustrates the combined average share of intent for the top brands that are there in these moments for hotel- and accommodation-related queries. Source: Google Search Data, all devices, Mar. 2016. 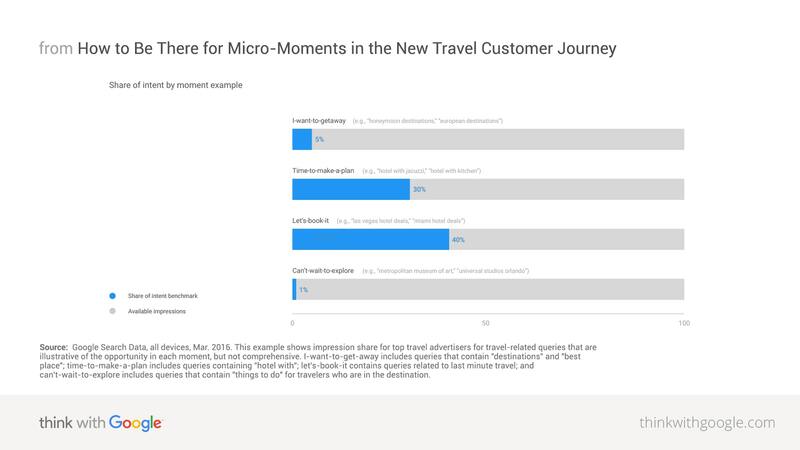 This example shows impression share for top travel advertisers for travel-related queries that are illustrative of the opportunity in each moment, but not comprehensive. I-want-to-get-away includes queries that contain "destinations" and "best place"; time-to-make-a-plan includes queries containing "hotel with"; let's-book-it contains queries related to last minute travel; and can't-wait-to-explore includes queries that contain "things to do" for travelers who are in the destination. As you can see, there are significant missed opportunities throughout the journey. In time-to-make-a-plan moments, for instance, the brands who most frequently advertise against searches related to hotel amenities like “hotels with [x],” on average have a 30% share of intent. This low share of intent happens on all devices, but it tends to be especially true on mobile. And this chart is just one example. Share of intent can be applied across travel categories and customized to reflect which moments are most important to a brand. To win travellers’ business, you have to commit to being there and useful in relevant moments across the travel decision-making process and across devices. Here is a guide to assessing the opportunity for your brand and the essential questions to ask yourself and your team. Look for yourself. Consider the most common searches performed by travellers in each phase of their decision journey and identify which ones are most relevant to your business. Are you there for these searches on mobile, and do you like what you see? Check out the competition. To see where you may be falling short, work with your team or agency to identify the searches you need to be there for in each moment, then find your share of intent, and compare it to the competitor benchmark for your category. Are you happy with how you compare to the competition? More importantly, are you happy with the number of travellers you’re there for in these key moments? Consider the right tools. Think about what other platforms travellers are using to make decisions including YouTube, Google Flights, and Hotel Ads. Pick those that fit your business. Are you there when they look for video content related to destinations your business serves? Are you showing in the results for flight routes and hotel searches, and when people want to book a hotel? Evaluate your content. When you look at the content you currently have, do you feel that it speaks to travellers’ needs and answers their questions in key decision moments? Determine consumer needs. Are there unmet needs that you can develop helpful content for? Account for consumer context. What situation are they in and how can you help? The bottom line: Travel marketers need to account for the new multi-device, multi-channel landscape. And those who are moments-ready—and consistently manage their share of intent to meet consumer demand—will take the lion’s share of the reward. To learn more about travel industry trends shaping this new landscape, explore more about the four travel moments that matter.